Woodcore panels consist of high-density composite wood core glue to and encased in hot dipped galvanized formed steel sheets. These panels have a class A flame spread rating and provide excellent rigidity, durability, and acoustic performance. NEW Air Seal! 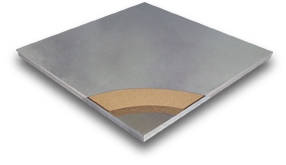 Mechanically attached air seal gasket eliminates up to 97% of the panel seam leakage found with standard Woodcore panels. Full range of factory laminated finishes. ULC Listed to Canadian Safety Standards.